Here are a few random things I've been meaning to share but haven't had the time nor the electricity to post until now. Lisa sent us some pictures that she took while she was here. Lisa was here on a Saturday, so we took her up to Los Guisaros. After all the kids had eaten lunch, Cecilia wanted to give me something to eat. Unfortunately, all the bowls had been used, and there was no water to wash the dishes. So, she just gave me the giant rice cooker pot to eat out of. Of course, everyone thought it was just hilarious and laughed, pointed and mocked me. (How I love it when people watch me eat). 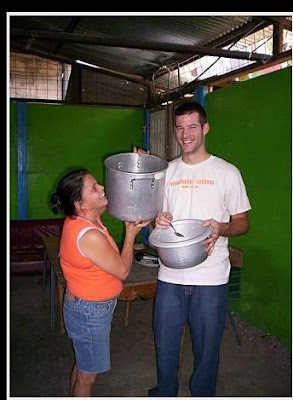 In this photo, Cecilia is taking the joke even further by offering me something to drink from the mixing pot. On our way home from the beach we ended up behind this truck on the windy mountain roads. You can't see much in this picture. It looks like your standard flat-bed truck carrying a car. What you can't see is that the family who owns the car is sitting inside it. It was another example of "things you would never see in the U.S." We felt pretty bad for the family, but we still laughed a bit and took a picture. Don't worry, we were discreet. I also added a few new songs to the 2007 song page.